It started out to be such a quick and easy project. Heck I had just finished one and it went so well... Ever heard those famous last words? I decided to make another of the Samurai quilts for a friend. I bought some beautiful fabric at the LQS for it, but I needed 1 more piece for a 1 1/2" frame around the center of the block. I had a piece of black tonal that would be perfect. I pieced together and stitched down the lettering in the center of the blocks, and noticed that there was some dye transfer on my machine from the red fabric I chose for the block centers. I knew I should have prewashed, darn it! So I made the decision to serge the edges of the top and wash it before I put the Samurai on it, just to be safe. Well, I thought that was a good idea until this mess came out of the washer. Horrors! Never in a million years did I expect the tonal to shred to nothing in the wash. I was so upset. The entire quilt had to be taken apart and put back together. (with a different border no doubt) Yes, there was steam shooting out my ears like razor blades!!!!! Lets back up a bit. I have always be a proponent for using all types of fabrics. I have never been a quilt shop fabric only snob, and really do feel that a mix of fabrics, is quite acceptable. Heck our budgets can only afford just so much. But after this mess, I am second guessing my decisions all together. You see this black tonal was a JoAnn's Fabric Keepsake Calico and was $7.99 a yard. I love the looks of the fabric, but after seeing just how it held up in the wash, I have to ask, just what kind of keepsake could it possibly make? The one that is shot after 1 wash???? Does the fact that it came from China have anything to do with it? After all, we have been bombarded with inferior Chinese products in recent years. I am putting this mess, on the growing list of why I won't buy Chinese "crap" anymore. I do realize that washing without something being quilted probably puts a little more stress on the fibers, but for the most part none of the quilt shop quality fabrics had such an issue. Although it was the red that started it all, and it was a quilt shop fabric that I paid over $10 a yard for. In it's defense, there was never any issue with dyes running after I washed it. I even thru in a color catcher and there was no sign of red on it anywhere. Good for that, but you can see, there was some significant raveling that went on with it, in the wash, although nothing like the black. I wish I had taken more photos of the back of the quilt when it came out of the washer. It was so full of strings that had twisted together, that it took me an hour to trim them all off, so it would lay flat. I had a huge fist full of loose threads. There is a happy ending to the story. The quilt top is all done and ready to go on the longarm for quilting. As for myself, I am going to have to do some sole searching about fabrics. My feeling right now is, if I use cheap stuff, it will be for backings and I will serge everything before using it. Or else it will just be used in and art quilt that will never be washed. Time is to precious, to spend it fuming over things out of our control! Am I right? On that note I wish you all a very Happy New Year. If your partying tonight stay safe. As for me the only driving I will be doing at midnight will be the longarm on this quilt. I am hoping that a big ole glass of wine will take the pain of yesterdays torment away!! wish you the very best for the holiday season. But there you have it. I just love it. Needless to say it's winging it's way to it's new home right now. I have exciting news here. As of Saturday I will officially be done with training and part time!! Whoop whoop! There is a light at the end of the tunnel, and I will see my sewing room again soon! That will give me the time I need, for the Quiltery's brand new Dec pattern. Now, is this just not the most adorable thing you have seen?? Not that I am counting of course!! It seems like I have spent no time at all, in my sewing room, and I really am not liking that too much. But I did get my Christmas Stocking for Aunt Pitty Pats swap off in the mail yesterday. I can't tell you too much just yet, but it is taking a very long trip to its new home, and I can't wait to see how my partner likes it! 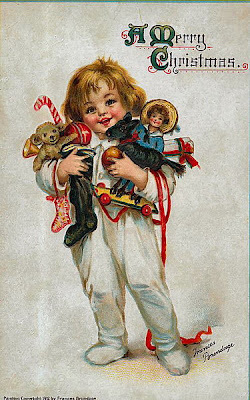 You know, no matter how old we get, we all can appreciate the joys of Christmas! I for one have those visions of sugar plums dancing in my head! What the heck is a sugar plum anyway? While I may be clueless about Sugar Plums, I can in fact say, I do know about Elves. Yesterday I took a little trip up to Estes Park with a friend and saw this one cruising down the street. 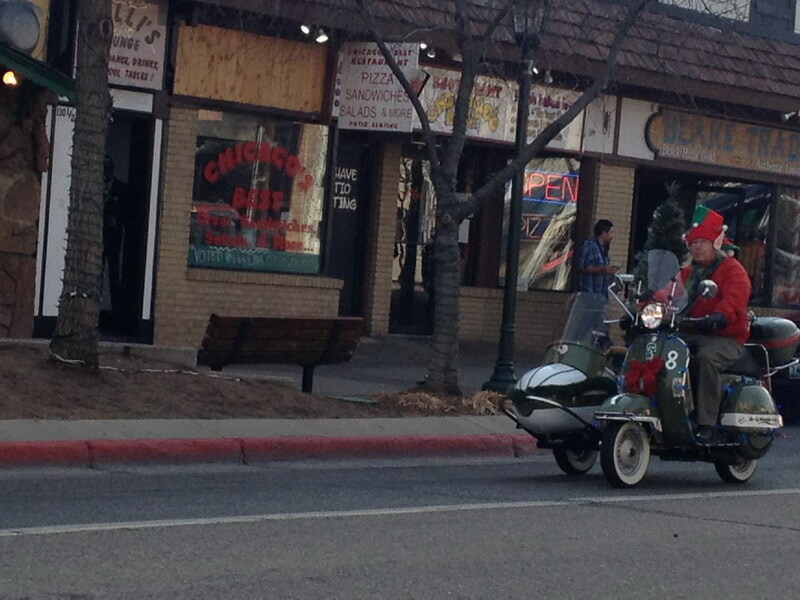 While our Holiday Lane hop may be over, the memories will stay forever. We saw so many fun takes on this adorable pillow, that my head spun! One of my favorites was the sewing machine cover turned into a haunted holiday lane. I can't get enough of my favorite, "Halloween" projects! Then there was the village made out of foam. What a fabulous idea that was. I am dreaming of a village on my fireplace mantel. Loads of bling and some rope lighting to make it shine. Now will I actually get that done for this year, probably not, but a girl has to dream. :-) All the fun snow ideas we saw, the larger pillows, the smaller pillows, hot colors, traditional colors, primitive colors, black and white, red work... I can sure picture another new and improved Holiday Lane in my future! Again I was just so humbled to have all the wonderful comments posted. My readers and followers mean so much to me. It sure makes me smile when I read each and every comment! The winner for this hop is... #80 (random.org tells me) Lyn left me this sweet comment! Wow your candy cane pillow is just so nice! Thanks for being part of the hop. So Lyn, you will be getting an email from me, to get your snail mail address! Your Connecting Threads package will be on its way pronto. Congratulations! Wishing Lyn and all my readers the very best holiday season. My blogging has been slow this fall, but I will be enjoying part time work in another month, and I am putting you all on warning. LOL!! My sewing machine will be working overtime to make up for lost time! I will have some fun ideas to share with you all real soon! Thanks for making my blogging experience as wonderful as it has been! I couldn't have done it without each and every one of you! 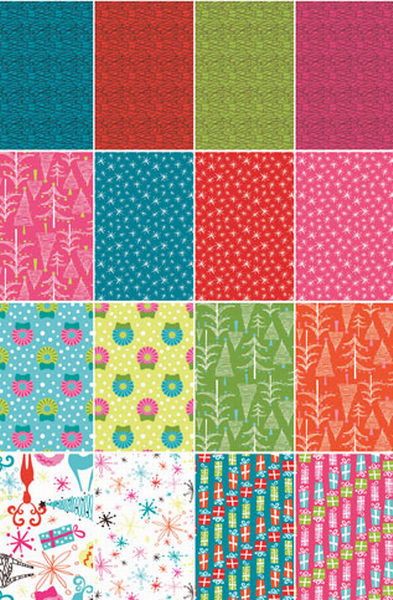 Thank you, thank you to Jill over at Jillily Studios, for sharing her fun pattern with us all. You know you've made our holidays special! And a big round of applause to Pauline, who thru computer crashes (oh don't ya just love technology) and the flu (tis that season), yet managed to get us all on track and organized for a fun hop! My hats off to you MS Pauline. Your a trooper and we love you! And Madame Samm...well, as we all know, there are not enough words to say just how special she is to us all!! My pillow is based on, nothing else but my favorite "candy" of course. 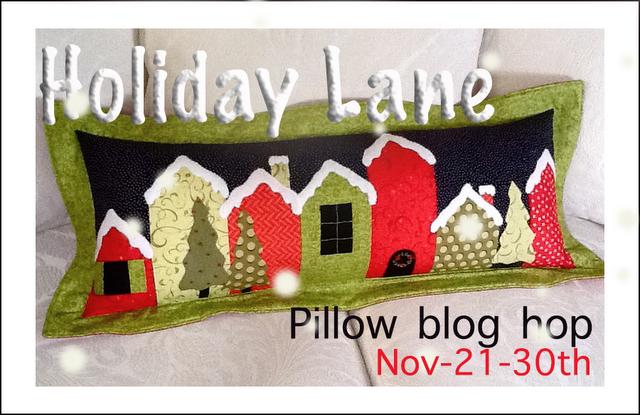 This Holiday Lane pillow is an entire street of Candy Stores, with a sky that's lit up with peppermint drops! Can life get any better? is complete with a gingerbread man guarding the door! Ok, so it shows what a Choco-holic I am! Now pink is not usually my favorite color, but this year it seems to have a new found place, in my color palette. Who knew? It seems to be perfect for my grandmothers antique settee. And the babies seem to be quite content with it all! A layer cake of Connecting Threads Technicolor Tidings. 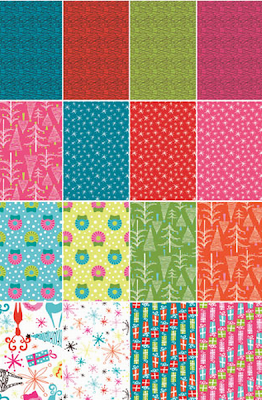 You can make your very own Holiday Lane with these great fabrics. Leave me a comment, and I will draw on Saturday Dec 1. Wishing your "Holiday Lane" will be filled with all your dreams. Be sure to stop by my fellow bloggers today and see what fun things they have to show you too! Who knew they sold threaded metal in 3 foot lengths? That a bag of nuts, some big washers, and epoxy glue and we were on to something. A perfect surface to glue to the bottom of the cars. It worked like a charm. I found an old transmission case in the never ending pile of (excuse my language) "crap" that my hubby has been storing behind the storage shed for years. Who would ever dream, that I would be the one to find a use for it. It was a one stop shopping day for me, as Home Depot had a great selection of cactus and drought resistant plants, even at this time of the year. The special potting soil and rocks... Everything I needed for the job! In fact they had some really cool looking plants there. Looks like I am going to have to find a soft paintbrush and clean up some of the plants a bit, but don't they look great? I am thrilled with the end results. What did I learn from this??? The next time you have a wild idea, go with it. There is really nothing to lose, and Home Depot will certainly come up with some outrageous way to make it work. 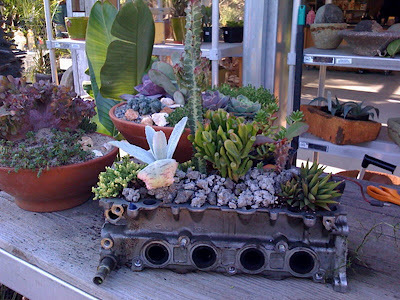 Is that a perfect combo for many crazy planters or what? I am delivering this planter to the guys at their new auto shop this weekend! Can't wait to see their reaction! While life has been crazy the past few weeks, I don't want to forget to give a big thanks to 2 very special people, who sent me gifts. First off a big thanks to Kelly over at "The Wooden Bear". 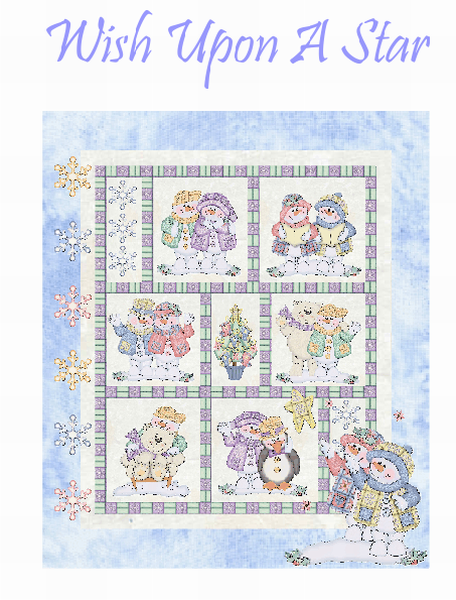 She sent me this adorable pattern for a snowman quiltie. Did you see that little scuff mark on the front? Well, don't worry, I almost missed it too. 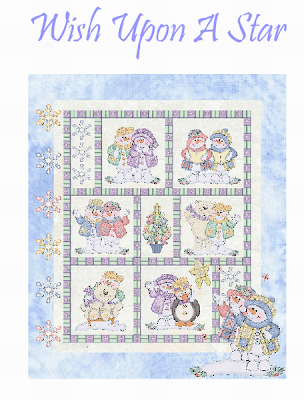 She has a give-a-way ever month, so hop on over here and enter to get your very own Bear Boo Boo pattern in next months drawing. sent me this wonderful fat quarter pack. All for leaving a comment of her blog during the "Wicked Blog Hop". Now just how cool is that? Are those some yummy fabrics!!! That's what makes blogging so special. Folks just like you! I am off to play with my new treats! Is this just too cool? And perfect for a congratulations gift, for the place my son works at. They just purchased a new building for their auto shop. "Cars" theme toys among the plants. Oh please oh please, my blogging buddies, how can I do this? I am trying to figure out a way to attach them to something I could poke into the planter. Floral arranger I am not, so if you have any ideas, I would love to hear from you! I was just so delighted to be awarded the SnippetFact.com web award. And just who is Snippetfact.com???? Because we are community based, information is rated by voting on facts that users know to be true. This way, you can see how trusted that fact is, and how credible that information is before republishing it on your own website or blog. By linking to us, using SnippetFact.com, or displaying this award on your website or blog, you are helping to improve the standard of factual content online. For every new visitor that reaches SnippetFact.com, we learn from that user and improve their experience for next time. Always improving and always moving forward to create a brighter, more alert, and healthier community. If I have said it once, I have said it a thousand times. You meet the greatest people in blogland. Robin had no idea just how much it met for me to find this today. My mom passed away on Thursday and with all the stress... Well lets just say, this package couldn't have come at a better time. If there is one thing I gained from my mom, it's the love of candy. Ummm... and the hips, that deserve a "WIDE LOAD" sign of their very own, and some things I probably shouldn't share! LOL!! So here's to you mom, I am eating it for you!! And thank you so, so very much Robin. You remind me every day, why bloggin' friends are so special! I know what generous hearts we have. 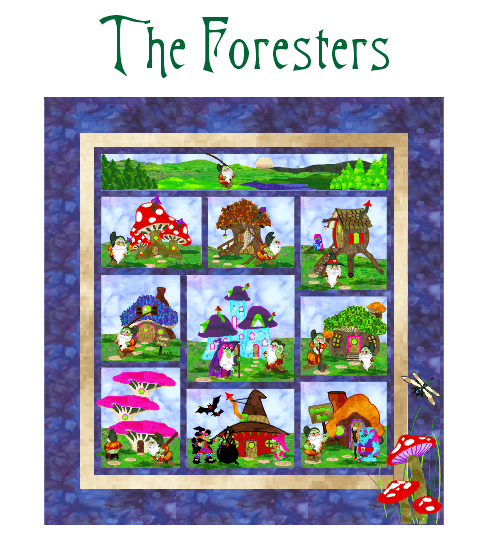 If you saw the post on Bonnie Hunters blog, (click here to view) you know they are looking for quilts for the Hurricane victims, who now have been plagued with snow on top of everything else. My box just went into the mail with these 2 quilts you saw here, this past summer. I can't think of a better home for them. In addition to that I put together 12 blocks for Erin over at the Vesuviumama. You can check that out HERE. Erin has posted the directions for this block that takes just minutes to make. She is generously putting them together and sending them to needy families. Gather up your scraps, it only takes 2, 7" squares of 2 different fabrics. I know that both these wonderful ladies will truly appreciate it, and will make sure the quilts make there way to those in need. Wishing the very best for our friends in need on the east coast. Our prayers are with you while you rebuild your lives! And every Halloween deserves a cupcake or two. Don't ya remember those days when you made treats for the kids classroom parties? My new and improved cupcakes are 100% natural, no preservatives, no gluten and best yet no calories!! Now just who wouldn't fall in love with these guys. Bumble bees, lady bugs, owls, footballs, etc etc etc. These patterns are a quilters dream. All those batting scraps we have collected... now have a home. That's what I call a bonus!! and have a Hauntingly wonderful Halloween! 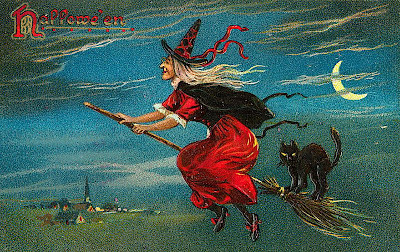 I do want to thank all of you who visited me during the Wicked Blog Hop, and for sharing all your wicked Halloween traditions!! Hmmm, ghastlie or wicked thing to do.... Make caramel apples dipped in milk chocolate. Congrats Lisa. I will be sending you an email, for your mailing address! Tic toc-tic toc... it's time! Wicked?? Did someone say "Wicked"?? A little "witchy poo" getting ready to cook up, a few kids!! Oops, I mean cook up a meal, for a few kids. And again I repeat, don't go ask'n my boys about my wickedness! Ummm...or, I'll get you my little pretty!!!! Now, on a more serious note. and machine embroidery designs, like the guy up top. Loads of great details, and some really outrageous designs. I just went crazy over there. Best yet, it's very-very affordable! I have no affiliation with them at all, just a very happy customer, who can't help but share! My block, is a part of this fun pattern. Don't cha just love it? I reduced it a bit to make a 12" square. It kind of reminds me on the 7 Dwarfs! "Witch" don't ya know, is why I love it! Heck I even love the embroidery they have to match! The Quiltery, offers their patterns individually or by joining the "club". I have to tell you, the club prices are great! They are in Australian currency, but for those who live in the US, like me, the rate of exchange was around $5 when it was all done. A bargain by any means! 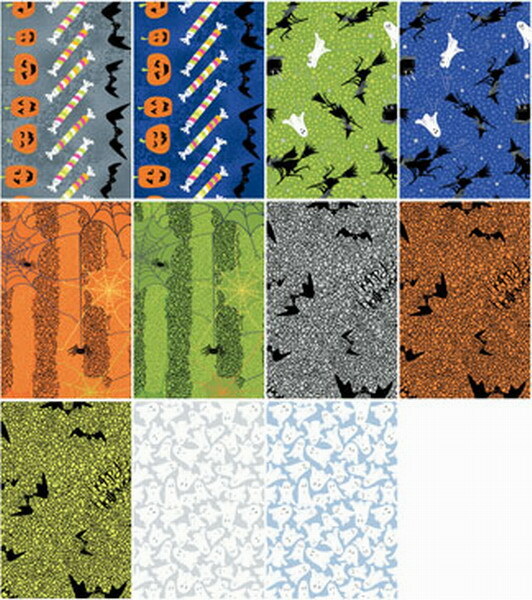 Oh, and by the way they are having a Halloween Spooktacular sale over there right now but only till the 31st! Check them out! I see they have put up a brand new pattern, in the Pattern club! I am so bummed that I didn't find it in time to get it done for this hop! But you know what I will be working on very soon, for next year! Now for being so great, and joining me today, I have a bit of a "wicked" offering for you! An "All Hallows Bash" sampler from Connecting Threads! You can create your very own wickedness with these guys. 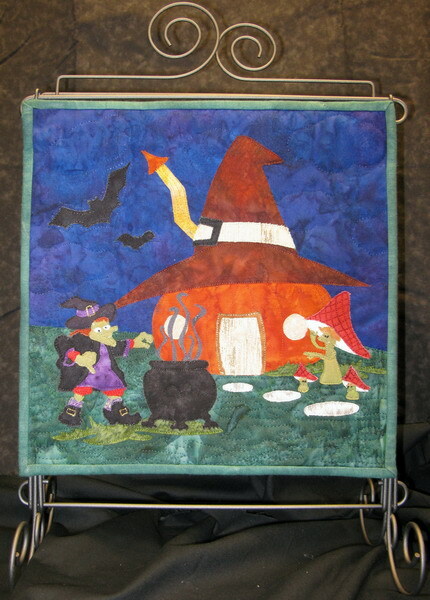 so, I am gonna throw in a Wicked potholder too. I know you want those Ghastlie faces staring at you in your kitchen! So be a follower, and leave me a comment about your favorite "Wicked" or "Ghastlie" thing to do for the season! I am going to be picking a winner Wednesday. So don't delay! A big thanks to Madame Samm for her endless inspiration and dedication to our favorite blog, and to the Wonderful - Wicked -Wendy, who has outdone herself in organizing us all! We couldn't do it, without you girls! So there you have it, all me "wickedness" for the day! 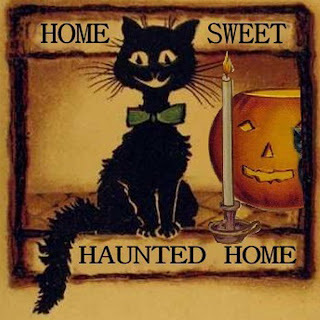 I wish you the most Wicked-ess of Halloweens ever! Cause you need to visit my other "wicked" quiltin friends.